Both teams of bell ringers use four octaves of American Handbells and a 2 octave set of hand chimes. 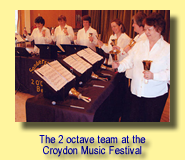 Both teams practice regularly in All Saints' Church Sanderstead and give performances locally at a variety of venues. 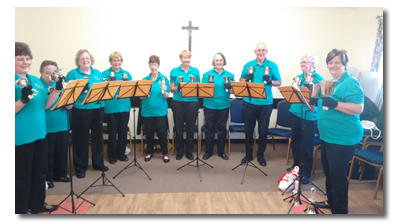 We can also give workshops, with the opportunity to try out handbell ringing for yourself. We are always happy to welcome new ringers, please contact us if you would like to learn more about Handbell Ringing. Click on the 2012 Concerts page for a short video of the 2 O'Clock Bells in action. Please see the list below for our recent and forthcoming performances. You've heard the bells, now buy the T shirt! 2 O'Clock Bells goods are available from our "Spreadshop", click on the link on the right. 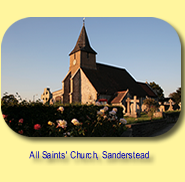 To find out more about Sanderstead Churches, visit the Sanderstead Parish website. To find out more about Sanderstead, visit the Sanderstead Residents website. Buy a T shirt, a bag or a mug with the 2 O'Clock Bells logo. Click on the bag to open our "spreadshop".